I usually try to keep pretty good track of where things come from. I’m frankly not totally sure if I had reference images for this. I went back through my Cyberpunk/Sci-fi Fashion Pinterest board and I didn’t see anything that reminded me of it. But I also drew it a while ago, so I can’t be totally certain. So, I was thinking a lot about layering and the interesting dynamics that layering can create. It’s also an outfit that I am a little worried might work better in concept than in execution. 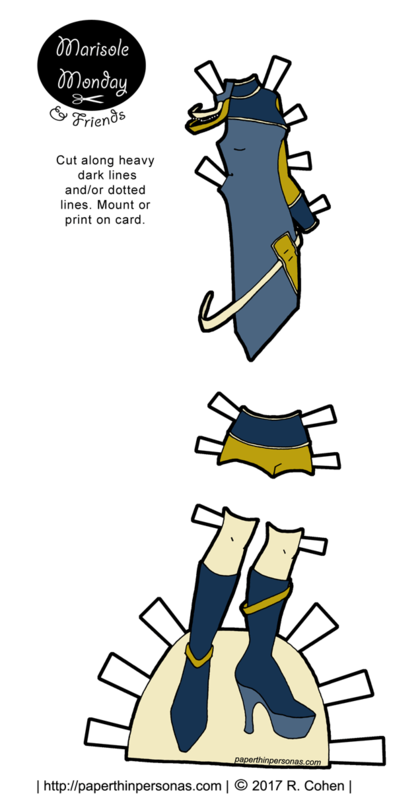 The idea is that the various bands wrap around the paper doll’s body and the shorts are layered under the dress/tunic thing. Given the way the dress/tunic thing is cut it would be rather exposing if there were no shorts involved. I mean, sure if that’s what your paper dolls are into, no judgement from this corner, but my paper dolls are going to wear the shorts. I had a really hard time coming up with a color scheme for this set. This color scheme I really liked. I reminds me a little of the 1990s Star Treks- The Next Generation, Deep Space Nine and Voyager. If it was in more neon colors than I think there would be a Fifth Element vibe. I also created a pink a teal version. That version is posted over on my Patreon page for my patrons to enjoy. If you’d like to see it, consider becoming a patron. It really does help keep the blog on the internets. 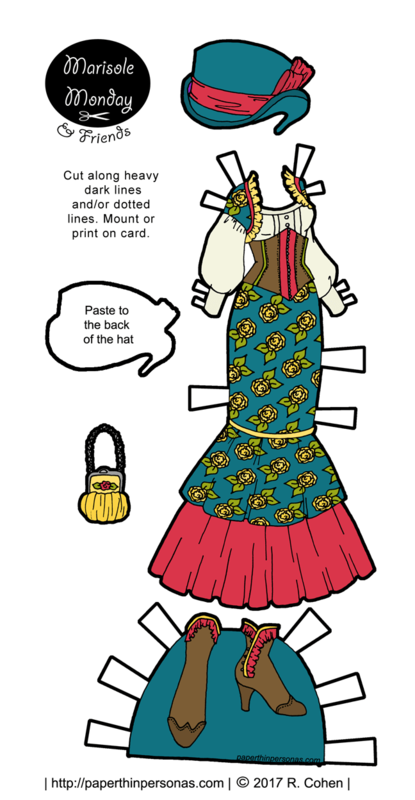 Today’s Printable Paper Doll Inspirations: Boccace, Des cleres et nobles femmes, traduction française anonyme circa 1488-1496, Boccaccio, Des cas des nobles hommes et femmes circa 1475 and Maria Maddalena Baroncelli Christus circa 1470. 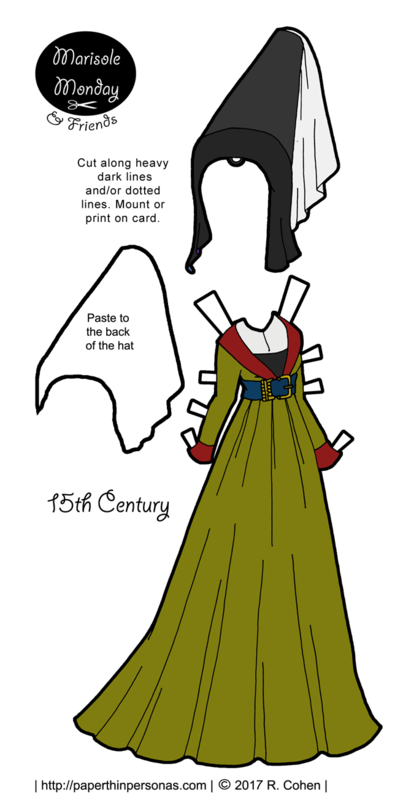 Today’s Marisole Monday paper doll gown is a 15th century dress. Women’s fashions of the 15th century included a long gown worn over a kirtle or under-gown. These gowns were in a high-waisted style with fullness over the belly decorated with a super wide belt. The belt often had a decorated buckle. The deep low neck was enough to reveal the decorated front of the kirtle beneath. The neckline was sometime filled in with a sheer linen partlet. I used a partlet on today’s gown, but getting the transparency was tough. So, it’s not as transparent as it should be. This headdress is known as a hennin. It was usually cone shaped or a flattened cone. They got pretty extreme over the course of the century, I have to say. If you think of the stereotypical princess than you are thinking of the hennin headdress. The sources of today’s 15th century dress were Boccace, Des cleres et nobles femmes, traduction française anonyme circa 1488-1496, Boccaccio, Des cas des nobles hommes et femmes circa 1475 and Maria Maddalena Baroncelli Christus circa 1470. One is a painting and the rest are manuscript pages, mostly from France. I really wanted to play around with color as well. The colors in today’s gown are based on Boccace, Des cleres et nobles femmes, traduction française anonyme. I really loved the green, red and the blue belt. There’s more images of 15th century dress on my 15th century Pinterest board. I’m not entirely sure how to describe today’s paper doll outfit. It’s a fantasy outfit, but it is not really a princess theme. I tend to think of princesses as being more formal. This is less princess and more something a charming milk maid wears in an opera. Opera costumes are on the list of things I’ve never drawn, but kinda want to draw someday. Anyway, I’d love to say something deep and meaning full about this one, but I really don’t have anything. I don’t even remember if there was a specific inspiration. I’d love to say it was operatic milk maids, but it wasn’t. Anyway, the top is kinda 18th century-ish. The skirt is sort of 1980s. The stockings and shoes have a vague 19th century thing going on. Mostly with the garters, as elasticized garters with metal fasteners were a thing in the 1890s. Elastic is actually much older than most people think. It was invented in the 1820s for fastening gloves and such. Oh, before I forget, there’s a second version of today’s design on the Patreon page for my Patrons. By the way, this week is a themed week. I really enjoy sorting things and organizing them into themes. (Yeah, not really shocking given that I’m a professional librarian.) This week’s theme is fantasy and especially different styles of fantasy. So, today we have a fantasy peasant dress, tomorrow there will be an entry into the B&B Sorceress series and on Friday a medieval fantasy set for the Sprites. Every paper doll has a beginning. Sometimes, the beginning is more complicated than other times. Today’s paper doll and cyberpunk dress came about because of the shoes. But a paper doll set needs more than one rocking pair of shoes, so I tried to image who/where one might wear a pair of strap covered platform shoes. Strap covered platform shoes immediately equate with cyberpunk in my head. I mean, you sure as shooting aren’t going to wear them hiking. So, the amazing shoes obviously needed a cyberpunk dress. I designed the dress to try to match the shoes. The narrow straps on the dress mirror the straps on the shoes. The two tone colors on the dress highlight the narrow strapping details. After all, if I am going to draw tiny narrow straps than I darn well want them to be obvious. 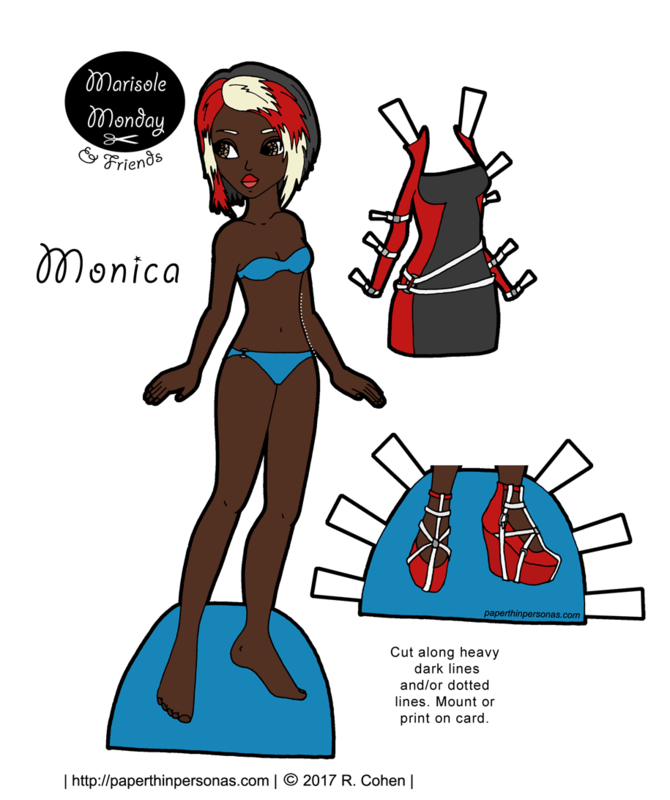 Then I realized that I had drawn a fair number of paper doll outfits in the latest batch of Marisole Monday & Friend’s content, but I did not have a lot of dolls. So, I needed hair for Monica. The hair would also need to be to toned, I decided. Because if you can match your hair to your shoes, why wouldn’t you? When I was creating today’s paper doll outfit, I was thinking about steampunk fashions. I was heavily influenced by this steampunk outfit I found on Pinterest. I particularly liked the two-tone skirt design, which I hadn’t seen before. In truth, I think I copied it a little more closely than I usually feel comfortable with, but that is neither here nor there. I am still learning to draw top hats, so today’s steampunk paper doll outfit was good practice. I am getting better at them, but I also think hats a generally challenging for me. Still, I will not get better if I don’t try. When it came time to color this Marisole Monday & Friends paper doll outfit, I knew I was not going with a traditional steampunk color scheme. I just get so bored with browns and creams after a while. Of course, if you are looking at this and going, “That is not what I want from a steampunk outfit.” Never fear! There’s a very traditional steampunk color scheme version on the Patreon page for anyone to download. And of course, if you decide you’d like to donate to support the blog while you’re there, than I would certainly appreciate it. As always, I’d love to hear what you think in a comment! Growing up in Alaska, autumn came very quickly. As soon as there was fresh snow on the mountain, known as termination dust, it was time to pull out boots and give up on summer. In Alabama, autumn comes in more slowly. It’s a gradual shift from the humid tropical weather of summer to a damp crisp autumn. While I don’t think the weather will last into this week, last week really felt like fall. Mostly, because we got rain from Irma, just rain- nothing serious where I live, and it made everything cooler and grey. 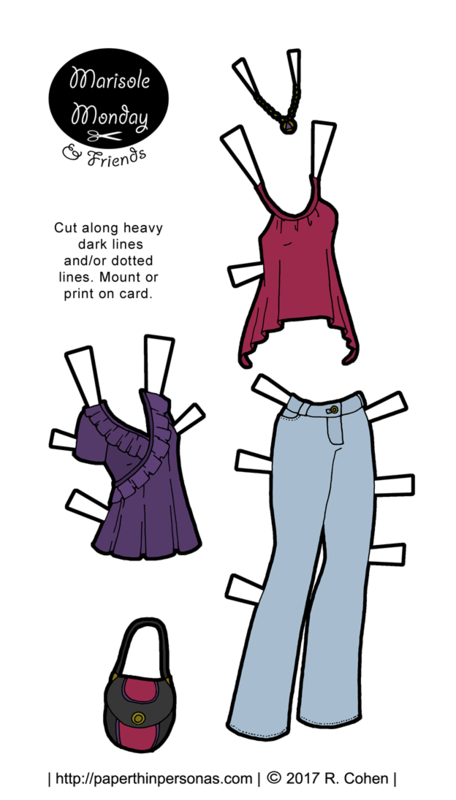 Of course, for a paper doll drawer like myself, the change of seasons gets me thinking about clothing. So, today, I wanted to share some transitional pieces. I’m not sure tank tops are really autumnal, but since it was in the 80s yesterday, I think they could be. The colors are more autumn than the paper doll clothing designs. In the fall, I think of wines, rich purples and dark teals. To counter balance, the rich colors, I did light washed jeans. Apparently, bleached denim is back, so I thought I would share some. I hope everyone is having a great autumn. I’m settling into my routine with grad school and work. The students have returned to campus (yay!) and I am enjoying working with them. I don’t know what it is about college students, but I adore interacting with them. Meanwhile, what’s your favorite thing about autumn? Food? Weather? Getting to finally wear boots again?